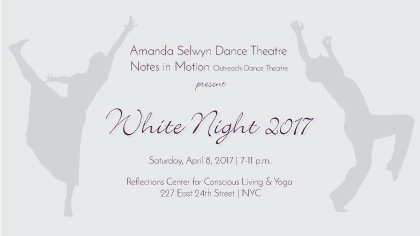 Saturday, April 8, 2017 | 7-10 p.m.
Live Music, Video, and more! See an intimate sneak preview of Amanda Selwyn Dance Theatre’s newest work Refuge, get to know the dancers, designers, board members, and company teaching artists. Small plates and cocktails will be served throughout the evening as patrons enjoy brief performances, cooking demos by celebrity chefs, Chopped competition, auctions, and more. NOT TO BE MISSED. Make a difference this winter by supporting dance performance and dance education — your dollars go a long way to help us to thrive in the studio, on the stage, in the classroom, and beyond. Donations are now being accepted for our Silent Auction. Consider making a tax-deductible contribution to the event. Click here to fill out our online donation form.